This is a major week for the EU, and Europe as a whole, with economic, social and political issues all high on the agenda as the UK’s Prime Minister David Cameron tries to secure his reform deal in Brussels. With the eurozone crisis still fresh in the minds of Europeans, economic growth and competitiveness remain fundamental to the negotiations. However, data from the European Commission suggests a positive picture for economic growth in the EU in 2016. This map, based on the European Commission’s Winter 2016 Economic Forecast, shows estimated GDP growth in the EU in the coming year. Ireland backs up last year’s record growth of 6.9% with the strongest growth forecast this year too. The Commission’s report predicts GDP growth of 4.5% in 2016. Romania also returns strong figures, with growth expected to be 4.2% this year – up from 3.6% last year. 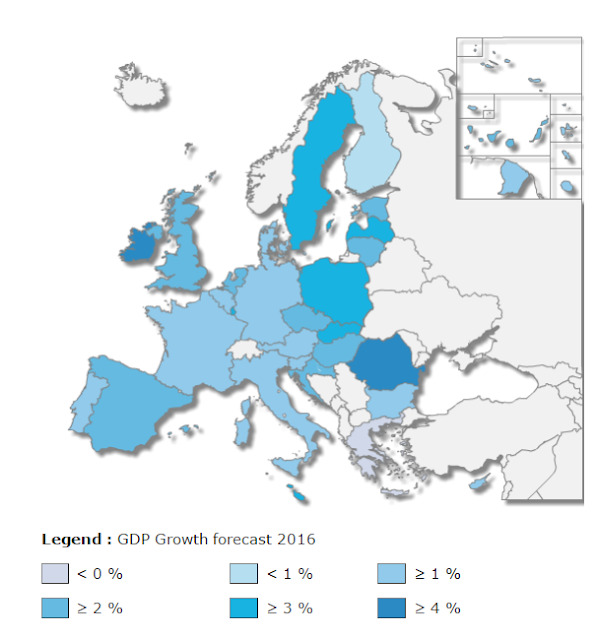 A number of countries see predicted growth of between 3 and 4%, including Malta, Luxembourg and Poland. The overall picture that emerges is an encouraging one, with positive growth predicted in the majority of the EU. Only Greece is forecast to see its economy shrink, although the outlook in Finland is for growth of just half a percent. Ahead of the negotiations, David Cameron called for competitiveness to be “hardwired” into the European Union. He told the World Economic Forum’s Annual Meeting 2016 that “first of all, it is about competitiveness”. Increased competitiveness would benefit not only the UK, but all of Europe, he argued. 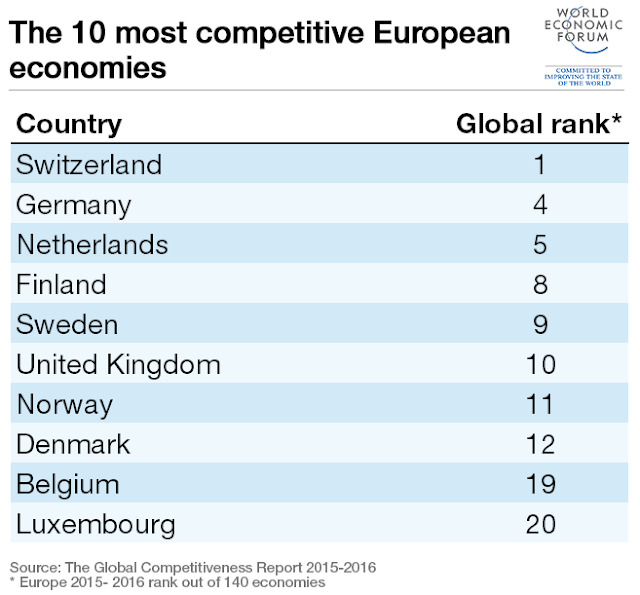 The World Economic Forum’s Global Competitiveness Report 2015-2016 named Switzerland as Europe’s – and the world’s – most competitive economy for the seventh consecutive year. Germany and the Netherlands complete the top three European economies. 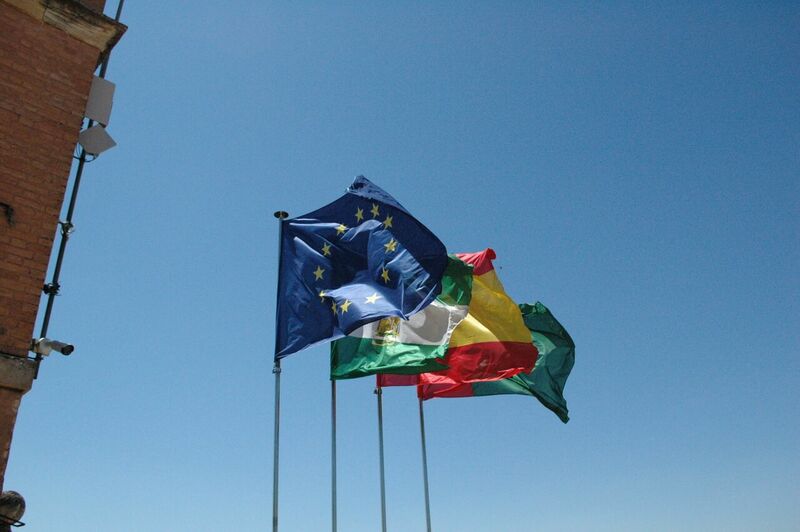 As the very future of the EU is debated, a positive picture does emerge. But as Europe's leaders stressed in Davos, there are challenges ahead to bolster the eurozone's long-term economic future.